Today Europe ended the second millennium and is now in its third. Apparently, it still cannot decide whether to take a minute and reflect on its heritage of the last two thousand years, which were extremely horrible and barbaric. One would think that only a beast would do what a human being did to another human being and humanity in general. Statistics of these acts, for sure would make it possible for Europe to discover that it was one of the most barbaric parts of our globe. But a research leading to these statistics neither in the past, present nor future will be conducted, as this would bring attention to nations that had committed the greatest crimes and human disasters in the history of Europe. One would like to believe that history would perform this duty and write its past accurately, but in fact it is the opposite. Each nation falsifies its past by writing what is convenient for them to hide the truth of their murderous deeds against humanity in order to protect their influence and national interest. Eliminating people and nations through the centuries became a discipline for Europe. Now, this behavior is being compensated with propaganda about European achievements in the field of economics, culture, education and social development. The memory of human sufferings in this hellish bucket of horrors called Europe, the dreadful deeds human beings did to other human beings, whenever possible is being set aside. In their discoveries, did Leonardo da Vinci or Nicholas Copernicus need to exterminate and subject human beings to sufferings to achieve their discoveries? I am asking, who authorized or under what law, barbarism became a European trade mark? My question is how it can be explained that a nation which performed extermination and destruction of another nation without conscience and scruples adopts that people‘s ´ identity and creates a false state in the name of the eliminated nation. Yet, in the 21st century the inheritors of this barbarism claim that they were actually the Prusian victims. The victims, the authentic Prusians, are not related to the Germanic race at all and have had nothing to say for seven hundred years. These people were laid on the altar as the victims of Christianity as interpreted by the Teutonic race, which appropriated themselves Christianity. Today their descendants are sowing seeds of revisionism, conquest, crime and hate. One can only see what has transpired in the past, through what they did, and is now history as the Second World War. Their actions in that world war, which was not too long ago, remind us of what they did in the First World War and seven hundred years ago to the Prusians. The Prusians, a Baltic nation a thousand years before Christ, as past historians tell us, lived on the territories of present Warmia and Mazury (Poland), the region of Kaliningrad and some in Belarus. In this part of Europe they were the oldest inhabitants and were known to Ancient Greeks and Romans from the first century. The Prusians were well known through the trading of yellow amber, and to this day their roots are tied to amber. What characterized them was their love for their home, independence and freedom. Their trade mark was hospitality and the assistance to lost travelers on the Baltic Sea. Unfortunately, circumstances changed circa in the 10th century when Slavic people started arriving at their borders. It started from simple skirmishes. Then, at the end of the 12th century the skirmishes developed into fiery battles. The main reason for these battles was foreigners infringing their borders. The ambitious Polish Dukes tried to gain control of the Prusian territory. Numerous battles by Polish Dukes did not give them victory and the Prusians continued their independence and freedom. The Polish Dukes also tried to conquer the Prusians under the guides of Christianity, and that also failed. Whenever disagreements started with the sword the Prusians were able to meet the challenge and were able to turn their enemy away without being conquered. Unfortunately, the Prusian victories created an illusion they did not see what the Europeans had in store for them. The unemployed Christian Teutonic Order of Knights, in other words Germans, were called upon the Prusian border for the purpose of turning Prusians from paganism and enforcing them to accept the faith of Christ. The purpose of this was to turn the Prusians into the next Christian nation in Europe. Even the Roman Pope had not foreseen the murdering and degrading tactics that German knights used. It is noted that the butchered Prusians murdered by this Order were buried without crosses. The German Order sowed death and destruction on the innocent Prusians and their land. They were not interested in spreading Christianity, their goal was to totally defeat the Prusians and claim their land. The Prusian people together with their Dukes fought heroically in the defense of their homeland, independence and the freedom. These brutal, bloody battles lasted for over fifty years during XIII century. The Teutonic Knights were able to add other countries to their ranks against the Prusians. These countries were Francons, English Nobles and knights of the Netherlands. These countries quickly recognized the real intentions of the Germans, that it was not their goal to turn the Prusians into Christians but to get their hands on their land. Because of the barbaric and brutal treatment of the Prusians by the Orders Knights the other countries abandoned the Teutonic Order of Knights claiming it was against their honor and human code. Conquering of the Prusian people by the Teutonic Order consisted of different elements of battle. After they had won the battle they would murder everyone or they would send the defeated to other areas. The goal was that the defeated Prusians would lose contact with the remaining Prusians, and would not lead their people to regain lost liberty and freedom. Actually, what was left of the Prusian people the Order used as slaves to build defensive castles, which were often built at such distance that smoke signals could be seen from each castle. There is no other place in Europe where there are so many castles in such a small area. The Prusians were superimposed by the Order to pay high taxes. This did not allow them to lead a good and honorable life. The Prusians began to escape but were quickly captured and extremely punished. Punished were also those who gave them sanctuary and a place to hide. The women were not shown mercy, they were raped repeatedly. Regardless of pacifications and extreme persecution the remaining Prusians organized uprisings some of which lasted as long as ten years. Unfortunately, the Germanic military reserves and strength were much more powerful than the Prussians were able to overcome. Because of the Prusian uprisings the German Order performed bestial acts for those times. Their methods were murder, burning of homes, and their possessions. Can you call this Christianity when the Prusians were murdered together with their children? Only women and very old people were left to live. The Order‘s goal was to eliminate the Prusians. You can easily make an analogy of this to what happened in World War II: concentration camps, executing professors, government employees, and people of culture, sportsmen, pacification and execution of Poles for harboring Jews. We all were witnesses to these atrocities in the 20th century. The same people performed the same acts seven centuries ago on the Prusians. This indicates that what the knights of the black cross had done seven centuries earlier was not forgotten and was applied in the 20th century. Many battles and unbelievable blood baths cost the Prusians 50% of their population. The remainder of Prusian people fled. Most of them escaped to Poland, smaller numbers to Lithuania and the land of Rus. The remaining Prusians, who were tied to their land, were used as slaves without any rights. They could not emigrate and were used for labor. Over the next several centuries the Prusians were relegated to the lowest class of humans. At the same time there was an intensive colonization of the Prussian land by the Germans. The facts which follow will prove that the statement above is authentic. These statements were taken from historical annals. The material is overwhelmingly frightening and if it was not based on facts it would be unbelievable. This material also summarizes the character of the Teutonic Order of German Knights and one can reflect that they used atrocities and murder to achieve their goals. It can be summarized that the 21st century, so called, German Prussian who claims that he was victimized and preaches revisionism, and is asking compensation for lost land, and resettlement of their citizens needs to deeply reflect on the truth, and anyone that sympathizes with them must also look at the real facts. The Teutonic Order started the conquest of Prusia in 1230 through 1283, a total of 53 years. The description of their wars with Prusians was scenes of flowing blood, hangings and burning alive. There were cases where complete villages were eliminated. Historians write that overall through these wars and emigration the population of Prusia dropped from 20% to 50% depending on conquered districts. It is estimated that from 170 000 Prusians that were living before the conquests at the end of 13th century there were only 90 000 left. The information above is concrete evidence of planned extermination of the original Prusians by the Germanic Order of Knights. 1. During the conquest of the land in Chelm the Order caught Pipin, a Prussian leader. Despite being borne a noble he was treated horribly. 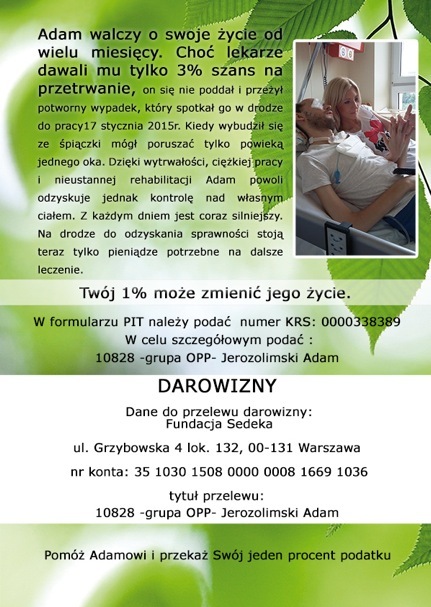 He was tied to a horse‘s tail and dragged to Torun where he was hanged on a tree. However, before that, he was horribly tortured. His insides were torn out and nailed to a tree, he was beaten and forced to run around the tree until he fell. It is worth adding that Pipin’s castle was totally destroyed and his followers were murdered. The same happened to his uncle and his followers. 2. The Pomezanian land of Resia was frequently invaded by divisions of the Order and supporting German regiments destroying with “robbery, fire and blood bath”, as the Order‘s chronicler honestly describes. 3. They behaved exactly the same way when conquering the land of Warmia later called Balga: “they invaded villages, destroying them with fire and robbery”. They conquered the castle “taking part of the people as slaves, and murdering the rest”. 4. A short time later the Order took the Prusian fortification of Partegal which “they burned to ashes; all of the defenders were executed, to the last one”. 5. 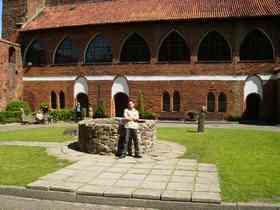 During the first Prusian uprising 1242-1249 the Order took over the fortification in Old Dierzgon where they “caught the inhabitants and killed all of them” unarmed men, women and children. 6. Also in the battle at Dzierzgon the Order not only killed all the Prusians they also took “their wagons with horses (food and arms) and pulled them to their castle”. 7. In about 1254 in the process of the conquest, the Order entered the richest Prusian land of Sambia. First they destroyed the neighboring land of the future Lochstadt castle by burning, “killing Prusians and taking many people into slavery”. 8. During the expedition to Sambia in 1254 by the Czech king, Ottokar who supported the Order, a Prusian leader, Gedune cooperated with the invaders. As a reward he was given a secret sign to be used by him to save his people when attacked. However, Gedune was late in arriving to his village, and found “his domain and relative‘s land burnt. His servants, relatives, and brother called Ringele, and all his cousins were murdered”. 9. During the same expedition Ottokar together with knights of the Order “burned everything that could be burned, many people were taken into slavery and many murdered”. In general “such a slaughter was performed on the Sambians that the elderly seniors offered them hostages so the whole nation of theirs would not be extinct”. 10. The next goal of the Order‘s conquest was the land of Wohnsdorf which was defended by the castle of Kapostete. This fortification was completely devastated and its surroundings destroyed, robbed and burned. The people were captured and killed. The same thing happened to the conquest of the territory called Ochtolite”. 11. Soon after one of the masters of the Teutonic Order from present Kaliningrad invaded the land of Natangia “devastating it with robbery and fire”. Murdering their leader Goduke, “as well as taking two of his sons, and many others, his wife with servants, women, children and booty” as theirs. 12. A brother of the Order by the name of Wolrad, commander of Natangia, invited many wealthy Prusians from the nearby of the castle of Leptenburg, “and when he got them drunk [....] left them, locked the castle with all the nobles inside and set it on fire, burning it to ashes”. 13. A brave Samb named Nalub for a long time did not surrender to the Order. Finally, he was forced to abandon his domain. The Order “murdered all of his servants and completely devastated his land”. 14. The greatest Prusian uprising was in the years 1260-1274. In the beginning it was successful but eventually the German oppressors won. Especially, heavy battles took place in Sambia, where some people were forced to run away, some were caught and enslaved and who remained was killed. The Order‘s chronicler bragged how they defeated the Sambians with the sword and took their women, children and burned their homes down. 15. The district of Rinow in Sambia resisted the knights of the black cross the longest. It surrendered only when the Order “killed all the men, took women and children with their possessions”. 16. During the uprising the Prusians several times tried to win back an important castle in Bartoszyce. One of the most horrific episodes of these battles was when the Teutonic Knights “on prepared gallows erected in front of the castle gate hanged 30 Prusian hostages, who were kept as prisoners”. 17. In the second half of 60‘s the district of Solidow in Natangia was “devastated with fire and robbed” and as Peter from Dusburg praised “many killed and taken as slaves”. 18. Land of Natangia was frequently devastated by Teodoryk from Meissen, who “three days and nights [...] was crossing Natangia, devastating with fire and robbery”. 19. 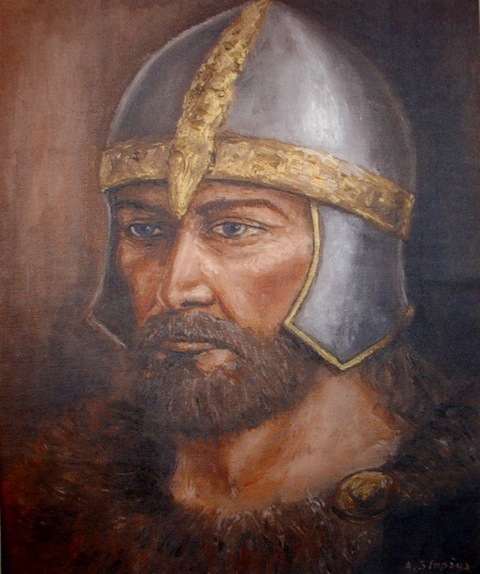 A famous leader of Natangans, Duke Herkus Monte caught by the knights of the black cross was killed in the manner, not practiced even in those days, not worthy of a brave knight “ he was hanged on a tree and when he was hanging in addition he was pierced with a sword”. 20. An identical method was used to murder Glappo Duke of Warmia. 21. Tremendous devastation during an uprising went through the land of Pogezania when the Order‘s army invaded “devastating from one end to the other with robbery and fire. Men were killed, women and children taken away into slavery”. They took over one of the most important castles in Lidzbark “all caught people were murdered”. 22. The next land destroyed with “robbery and fire” by the Order was the district of Lethowis in Nadrowia. After the seizure they “killed or took into slavery many people, [...] castles and surroundings were set on fire and burnt. They stripped the land of horses, cattle and valuables and with difficulty could carry them away”. 23. Similar things in the district of Nadrowia-Kathow, where they conquered the castle Otolichia “and murdered all men, took into slavery women and children and the castle was completely burnt down”. 24. The same destiny met the people of Nadrowia, inhabitants of the Kaminiswika castle. 25. After defeating Nadrowia next in line was Skalowia. Similarly as in previous cases killings, slavery, robbery, devastation with fire of places like Ragneta, Ramige and Labiau. 26. Conquered Prusians once again stood up to fight for their freedom and in 1277 Pogezans started an uprising. So it happened that again the victors were knights of the Order who “invaded the land of Pogezans, killing an unaccounted number of men, devastating territory with fire and robbery, kidnapping women and children and taking them away”. 27. The final act in the bloody conquest of Prusia was the people of Jacwiez. First they intruded the district of Kimenow “many men were killed, [...] thousands of men were kidnapped, taken away as slaves”. 28. Afterwards, the district of Meruniska underwent destruction in which 800 “men of great honor” were killed, and 600 “of both sexes” taken into slavery. The rest was murdered, the district was ransacked and burnt down. It is worth noting that in contrary to Nadrowia and Skalowia some men were saved. The Order started to worry about the shortage of labor. 29. In the conquest of Jacwiez the Order was supported by volunteer bandit knights, who raided villages and their inhabitants “caught and murdered”, men, women and children, robbing what was left. In another case of an assaulted village “ten men were murder while taking a bath [...], horses taken away, cattle and other booty together with all women and children”. 30. Step by step the Order with murder, fire, sword and slavery took into possession the districts of Jacwiez - Pokima , Krasima , Silia, Kirsnowia and others. 31. The conquest of Prusia had its end in 1283. At least twice Prusians tried to recover from above atrocities by taking arms and fighting for their freedom. In both cases they suffered from a defeat and participants themselves “found death from different tortures”. 1. During the conquest of Pomezania by the river of Dzierzgon an enormous battle occurred (ca. 1235) and is described by the Order‘s chronicler as “a blood bath of Prusian people, 5000 were killed that day”. Numbers in the middle ages were often exaggerated by the chroniclers, but it does not change the fact that in battles Prusians were not salvaged. 2. In the battle near Balga Teutonic Knights murdered all Prusians “extermination was complete, so that not a single one was saved who could carry the news of what has happened to their next of kin“. 3. In the year of 1263 in a bloody battle in Bartoszyce 1300 Prusians were slayed (“hardly anyone survived”). 4. In the second battle at Dzierzgon, during the second uprising of Prusians, the Order “killed so many of them that never before were so many people killed in one day”. 5. In the battle of Bezledy, in the end of the uprising, the army of the Order murdered over 2000 people of Jacwiez”. Besides destruction and loses due to wars, the depopulation of Prusian people was caused by resettlements forced upon them by the conquerors into other Prusian regions. The people of Jacwiez, Nadrowia and Skalowia suffered the most. They were placed on the Lithuanian border. The above examples of battles for Prusia prove that sufficiently. By resettlement of these people it was obvious that the Teutons formed an empty natural defensive region. This is how a Jacwiez noble, Cantegerde together with 1600 natives was settled in Sambia. Another noble Russigenus arrived with his family to Balga. In the south similar resettlements took place in the territory of Galindia and Sasinia. This resulted in those territories being deserted as indicated by Peter from Dusburg in a chronicle titled “Grosse Wildnis”. This was not a small resettlement, for example settled on Sambia Prusians were called Jacwiez, they were living there to the 16th century and there was a distinct enclave which was called “Sudauischer Winkel” (Jacwiez Corner). The Barts underwent another resettlement in Pogezania and even tried to uprise in the year 1286 . The people of Galindia in Warmia we know from the Plastwich chronicles and the Teutonic Order also performed a massive resettlement to Sambia, Pogezania and Natangia on them. Attaching great value to resettlement from bordering lands by the Order may indicate the case of a heroic Jacwiez noble, Skomand Younger, who could not fight the Order any longer and voluntarily, emigrated with his people to Rus. However, he did not find this situation to his advantage and quickly returned to his fatherland. 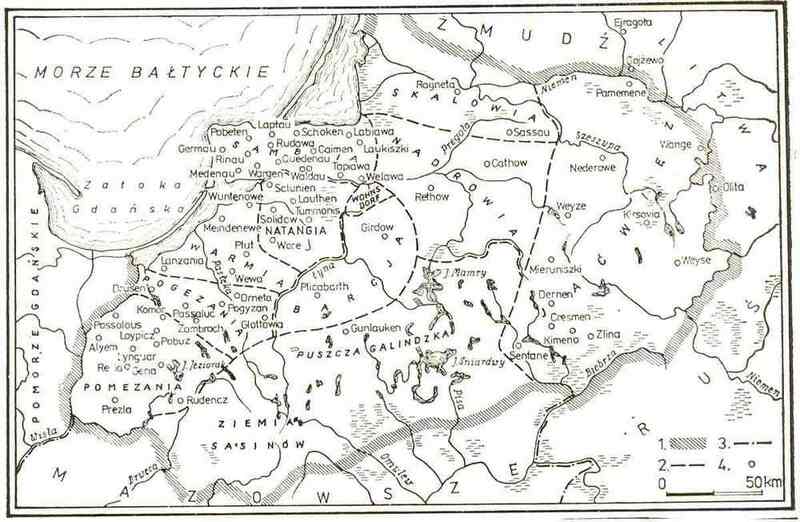 The Teutonic Order immediately ordered him to move with his family and followers westward in the area of Gorow Ilawecki. The next contribution to depopulation of Prusian people was by running away from the Teutonic Order. The places of their exodus were Poland, Lithuania and the land of Rus. 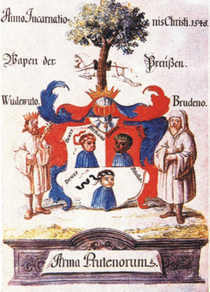 Poland testifies to the names of Prusian origin and their coat of arms. An example is the Prusian Teodoryk castellan of Bydgoszcz known from Greatpoland Chronicles, or the palatine of Tczew and Gdansk, Wajsyl and his brothers, Glabune and Sadyk and his descendants Dziwana or Ramot. In the year 1257 the sons of Prusian Letauda ran off to Mazowia, however the Order later asked the Prince of Mazowia for their return. 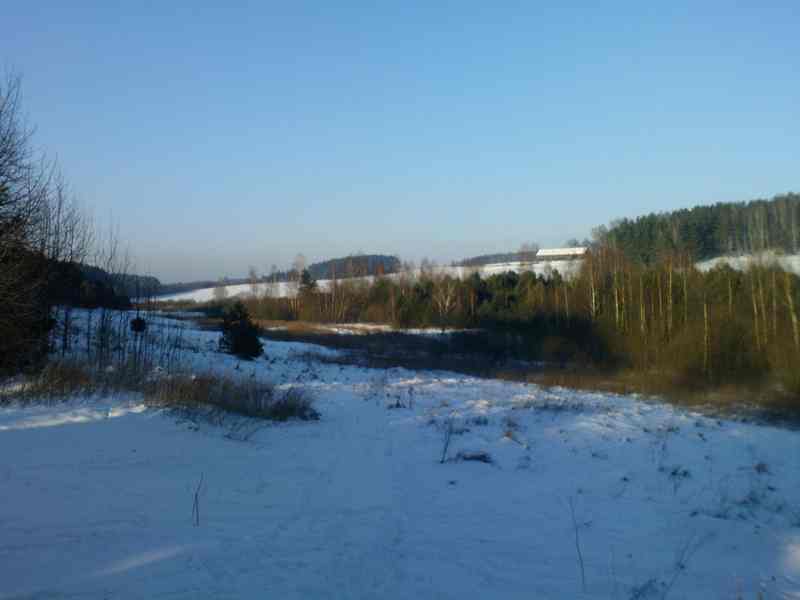 In the land of Rus researchers confirm by archeological and onomastic discoveries a strong group of Barts and Skalowians who settled in Grodno, Lida and Slonim. In this area and in Lithuania the Prusians from Jacwiez settled and they numbered at least 5000. An example of this emigration was their leader from the Prusian Kymenow, Skurdo and his people. One can hypothesize that the emigration of the Prusians contributed to their defeat by the Order, because the ones that fled were the active, and wealthy, the ones capable of fighting. Taking into account the ones who emigrated (ca. 10 000), there were at least 1000-2000 men capable of carrying arms. A definite amount of Prusians stayed on the territories conquered by the Order. However, only a small, mainly prosperous amount of Prusians found themselves in a new situation and made a career. The remaining was grouped together in villages ruled by the Order. They were subjected to high taxes, hard labor, and were exposed to a dominate role by the Order until the 15th century. The social life and laws discriminated the Prusians even more than the new Polish and Lithuanian settlers, not to mention the new German colonists. Internal changes and the weakening of the Order in the 15th century made it possible for the Prusians to ask for improvements in laws concerning them. First the Grand Master of the Order Conrad von Erlichshausen, in the year 1441, confirmed that widows and their daughters would receive under Prusian law half of the mobile possessions, the remainder together with the land was taken by the Order. Later, in 1441, the Grand Master agreed that the land taken by the Order in the area of Elbing and Dzierzgon will be given to the daughters of the deceased, provided they marry a man that the Order accepts. However, when the Grand Master Henry von Richtenberg in the year 1476 issued the so called Sambian Privileges, he allowed in the case of Prussian knights to keep everything that belonged to them. The remaining (Prussian serfs) were left out, with no hereditary laws. At the same time, their responsibilities to the Order were very high, they had obligatory military service, corvée and had to give levy. Much is said about the Prusian situation in the successive edicts (called Landesordnungen). One can recall suspicious edicts from 1310, at the time of Grand Master Siegfried von Feuchtwangen in which the Prusians had to attend Holy Mass, and the attending Mass German‘s duty was to watch that they were not using the Prusian language and force them to use the German language. Furthermore, in this edict it was forbidden for a Prusian to hold office of influence or to hold office of significance under the German jurisdiction. These significant offices were not to be held in the cities, suburbs, villages, courts, taverns and public houses. It was not allowed for Prusians to serve beer, but they were allowed to settle and work on abandoned lands. This was limited only to a certain group of Prusians and not to the total population. In this light this type of order seems to be understandable because it was feared that if all Prusians received some land, the German settlers would be exposed to the Prusian way of life, and this was feared the most by the Order. The next edict pertaining to the Prusians came in the year 1406 during the rule of Conrad von Jungingen. It concerned settling forest areas, mainly the south east areas of Prussia and stated that whoever wanted to settle in German villages must ensure no Prusian would settle on a German possession. It was forbidden for Germans in the cities, German villages and taverns to accept service of Prusian laborers or servants. If for some reason they found a Prusian employed in that service he would be subjected to the Orders court. Moreover, no free Prusian could employ a Prusian laborer or servant without knowledge of their parents. The parents had the right to make them return. If the parents agreed they could serve. It was also underlined that no Prusian woman or man was allowed to serve in German cities or villages and operate a tavern. It was forbidden for Prusians to settle in villages under the German law. It was further forbidden to take Prusians into service. It was prohibited for the Prusian people to leave their villages because they were serfs of the Order and the Order profited from their labor. This decree happened to be unsuccessful and this is confirmed by the Prusians themselves. In the year 1427 there were a couple more items that pertained to the Prusian people - first anyone who had Prusian serfs had to make sure that they participated in the Holy Mass; it was also forbidden to accept men and women of Prusian decent to serve in cities, which really meant to work also in the villages, taverns, fisheries and in the sale of beer. Those who employed Prusians had to pay monitory fines. It was also forbidden to sell German property to Prusians, agriculture land, and plots of land under the German law. The following point was again repeated that it was forbidden for the Prusians to work for the Germans without their parent‘s agreement. In theory these edicts were repeated, however this time disobeying these edicts resulted in fines. Repeating these decrees appeared to be contradictory, for example, accepting Prusians for work and even selling land under the German law. All the edicts for the year 1427 were repeated by the following Grand Master Conrad von Erlichshausen in 1441 . The only difference was the selling of German land to the Prusians. In the same year 1441 the Grand Master issued another edict that forced free Prusians in the forestry to give horses during hunting season or other escapades by the Order. In the same edict it was directed that Prusians who owned land under the Chelm Law inherited this land and the Order could not take it away from them. This last point indicates and demonstrates that despite the Prusians receiving these rights they were still treated differently than other settlers. The following edicts in the year 1444 repeated the previous edict however, fines were added if the edict was not obeyed. If someone would hire a Prusian for service or work that person would have to pay half of a fine. Once again in 1452 the edicts were repeated. In 1482 it was forbidden to hire Prusians and teach them a craft and trade (only cities and suburbs). Here again a possibility was mentioned to sell land by a peasant as long as it was under the Chelm Law, and with agreement of his master, and the right to live where he wanted. In the case of Prusians it was declared that the old law should be maintained. It was confirmed that there was a possibility of Prusians to leave their estate, however this applied only at the will of the masters. If the masters (usually the Order) did not allow, the Prusians could not leave. In the following edict of 1503 it was reminded that Germans must teach Prusians and Lithuanians Christianity. This subject was widely expanded in the year 1540, it was first confirmed the Prusians could settle in cities only with the approval of their masters. The next step was the question of inheritance by free Prusians and peasants. In the peasant villages under the Chelm Law the son inherited what was the father‘s; if there were more sons, then the master chose one of them, and left him on the father‘s possession. The rest of the brothers were not allowed to leave that land without permission of the master; in the case where only a widow and daughters were left, the master chose a husband for one of them and he would inherit the land. Mobile possessions that were not connected with managing the property were distributed among the widow, children, and relatives of the deceased peasant. This was also the case when the land was inherited by the new owners (husband of widow or daughters). In case there were no inheritors, the deceased‘s relatives took care of the land, however, only those who were allowed to participate in mobile possessions. Among the free Prusians the estate was inherited by the son that was chosen by the local ruler, if there were other sons they were to be settled by the local ruler in other places. In the case where the chosen son who was to inherit the estate died with no children, the land went to the local ruler. In the year 1550 during a conference there was a proposal to improve and add to previous edicts. The proposal said that after the death of a brother the remaining brothers or sisters would inherit the deceased brother‘s estate. Freeing the Prusians from service would also apply to his inheritors, they also would be free. In the case of mobile possessions it was proposed that the Chelm‘s Law would be observed by the inheritors (inheritors were sons and daughters). Free Prusian brothers were insured freedom in resettlement. This was simply a proposal however it appears that it did not become law. The enactment of a new edict finally came in 1557, and in the case of inheriting land under the Prusian law, new changes were made. The son continued to inherit the land as long as it was approved by the local leader who was German. The remainder, for example peasants were allowed to learn crafts and trade. The owner of the estate had to make sure that the sisters or widows were taken care of. The brothers (free) were to be placed on other free land. If that was impossible or if they did not want this, they could negotiate with the local authorities to leave (by buying themselves out). In the case of the inheritor dying and leaving only a daughter the authorities would pick a husband for her with her approval. In this case her husband became the new owner of the land. If there was no daughter the land was inherited by the deceased brother. The Prusians could apply for a free status under the Chelm Law if they served as pastors. Prince Albrecht ensured them this status in the year 1541. This status could be passed on to the next generation. The above indicates that the Prusian people‘s rights were not consistent but were for sure deficient compared to other ethnic groups. The Prusians did not have profitable rights of inheritance, however they were profitable from the ruler‘s point of view. They were not allowed to sell land and acquire new land; they were not allowed to go to new villages as servants, craft or trade workers. Only after the second half of the 15thcentury Prusians were allowed to settle in German villages. All of this made it difficult for the Prusians to colonize the forest, basically, one can say that they did not have rights they could rely on, and they were relegated to being serfs. Characteristically, only the Prusians were under the Order‘s jurisdiction, no other ethnic group was under their jurisdiction. In the 16th century a critical moment arrived for the Prusians, in only several decades they lost elements which differentiated them from other ethnic groups living on their land. What happened? One of determining factors was the adoption of the Christian faith. Baptizing was not enough to take away the old believes and habits. The Order did not place much weight on missionary action. The burden of teaching Christianity was first taken by the Order and the Christian Church. The lack of deeper religious life of the Prusians was due to a language barrier. There were not enough priests who knew their language, there was a shortage of interpreters, and many times the elders had to go to children for help who easily learned the German language, even for confession. Only in Lidzbark children were educated how to help the priests. Therefore one can not blame the Prussians that even in 15th and 16th century they still gathered for pagan rituals. The above situation changed reformation. There was tremendous pressure for religious education, three times the catechism was interpreted, three times into Prusian language (1545, 1561). There was big pressure to teach the Prusian language to a larger number of priests. The priests were given a scholarship of the University of Krolewiec today it is called Kaliningrad. However, immediately an issue arose from the candidates. This resulted in special care taken to get interpreters and schooling Prusians in churches, still in the German language. All of these changes were followed by ruling out pagan traditions and habits. One of the last stages in loosing Prusian identity was losing of their language. Even in the first half of the 16th century the catechism was interpreted into Prusian language. Prince of Prussia, Albrecht, of German descent, was still giving scholarships to the Prusian to learn the German language. At the same time, the Prince was complaining that in his time there were no priests speaking in the Prusian language. The fact is that during the visitation of a Christian church in Sambia in the year 1569 there were no interpreters in some districts, which only shows how fast the population was turned into Germanic habits and culture. During the second half of the 16th century there was no discussion of forming Prusian schools, only German, Polish, and Lithuanian. In the 17th century the chronicler Christopher Hartknoch mentioned that only elder people knew some words of the Prusian language. He also said something very interesting before the twentieth year (that means the first half 17th century). Hartknoch mentions that he knew a man that knew the Prusian language, and even its dialects. He was bragging about this to a doctor in Konigsberg. One can see the complete disappearance of the Prusian language within not even a hundred years. Why did this language disappear so fast? There were many reasons for that. The process of forced assimilation, and equalizing Prusians with other ethnic groups, eliminating their engrained habits, and above all, forcing them to go to parish schools (a school in each parish, however in the German language). This was the final German solution in eliminating the Prusian race and their language!!! In the year 1187, for the first time, the Order fell into sultan Saladin’s hands from whom the master and his suite had to escape. They were known of little chivalry but on the territory of the then Europe their significance could not be underestimated. With other crusaders they defended Acre from Islam without result; they had to flee by sea. While getting aboard the ships the then German master Conrad von Feuchtwangenza promised the brothers a revenge on the pagans in Prusia to compensate for suffering a defeat at the Muslims hands. After driving away the Order by the world of Islam from Syria and Palestine the monk‘s aspirations turned elsewhere - to constitute a homogeneous, German-Order country in the basin of the Baltic Sea through eliminating the Baltic people and their social structures. A full political support was given to the Order mainly by Popes, therefore by all monarchy in Europe. 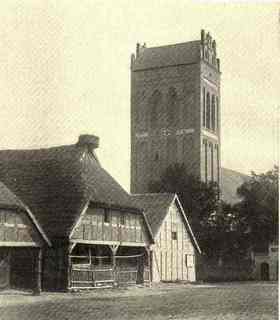 From the year 1200 the Teutonic Order began establishing their financial base. In the end of the 13th century they already formed an economic power in Europe where they owned enormous properties. In Spain the Toledo region in the Castilian Kingdom as well as the vicinities of Seville was also theirs. And on the territory of France, the region of Provence, Burgundy and Champagne. However, it was Germany that constituted the biggest financial resources of the Order. It obtained huge estates in Thuringia, Saxon, Bavaria, Swabia, Westphalia, etc. The provinces of Lorraine and Alsace were also the Order‘s headquarters. It owned venues in Rome, properties on Sicily with a base in Palermo, a port island, Isola della Doana at the mouth of Venice. The Netherlands, Greece, the Czech Republic, Austria, Hungary and even Armenia were partially in the clutches of the Order. On the territory of Germany, not only did they own an economic base but also human resources including the elite of Christian knights from all around Europe which was used for the conquest of Prusia. Their wealth was infinite enough to hire an army. They merely lacked their own country with a local slave force. In the name of propagating Christianity, which usually meant baptism or death, Europe sanctioned the cruel conquest of the Prusian people. To sum up the foregoing, one could say that the German Order of the Blessed Virgin Mary lacked any moral guidance whatsoever. Men were murdered, captured children were fit for work and women were used in whorehouses by every castle of the Order. To end with, a quote of von Kotzebue, a German historian - he described the Order as ‘a giant with no faith and shame‘ with its power built ‘upon the ruins of an abused humanity‘.